Property and Genealogy during the Wars of the Roses and the reign of Henry VII. 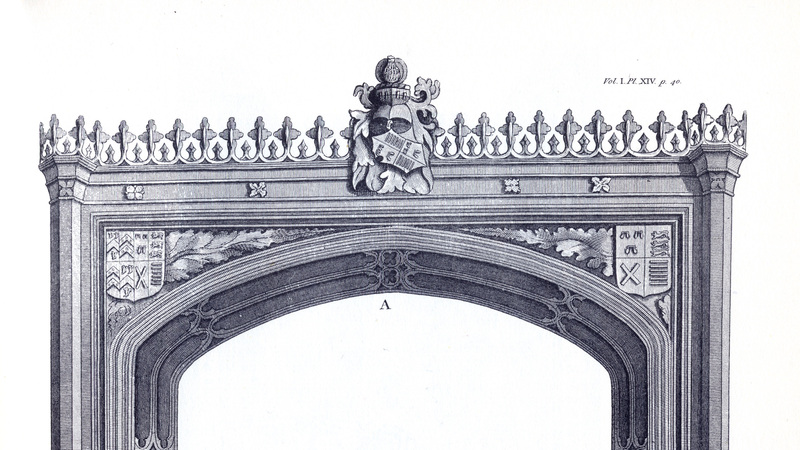 Heraldic shields on displayed the upper part of the tomb of Joyce Cherleton, Enfield (from the engraving in Nichols, 1795). Lady Cherleton was Edmund Roos's grandmother. Edmund Roos shield, top-right on the tomb of Lady Joyce Cherleton, Enfield (after Nichols). The four emblems are, clockwise from top left: Roos, Holland (Dukes of Kent), Badlesmere, Tiptoft. The shield of Sir Thomas and Isabel Lovell, on the tomb of Lady Joyce Cherleton, Enfield (after Nichols). 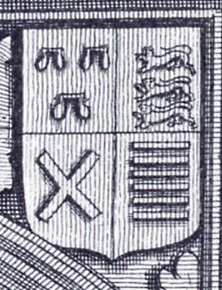 The left-hand side of the shield, as we see it, shows the arms of Sir Thomas Lovell, the right belongs to Isabel Lovell (nee Roos). Engraving of John Nichols, the 18th Century publisher and antiquary. 10. How did things work out? This essay has its roots in John Nichols’ History and Antiquities of the County of Leicester, in two passages in particular in which Nichols repeats, word for word, parliamentary documents from the years 1485 and 1492 that played an important part in the history of Belvoir Castle. In the first, Edmund Roos petitions King Henry VII for the re-instatement of his father’s property and titles. 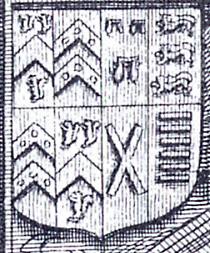 In the second, the Roos estates are placed under the control of Sir Thomas Lovell, one of Henry’s right-hand men while Edmund Roos was said to be ‘of insufficient discretion to guide himself and his lyvelode’. They come from the period of about 65 years spanning the Wars of the Roses and the early part of the Tudor dynasty. In 1460, Henry VI was deposed by Edward IV, who reigned until 1483 apart from a brief period in 1470 when he was forced out and Henry VI was “readepted” temporarily by “Warwick the Kingmaker”. Richard III’s turbulent reign from 1483 to 1485 ended with the Battle of Bosworth, which saw Henry Tudor claim the throne as Henry VII. He was succeeded in 1509 by his son Henry VIII. Meanwhile, Belvoir Castle lay in ruins. The medieval Barons Roos had been vanquished, and Belvoir changed hands six times. The Roos would eventually return as the Earls of Rutland, but it was not to be a smooth transition, nor was it inevitable. 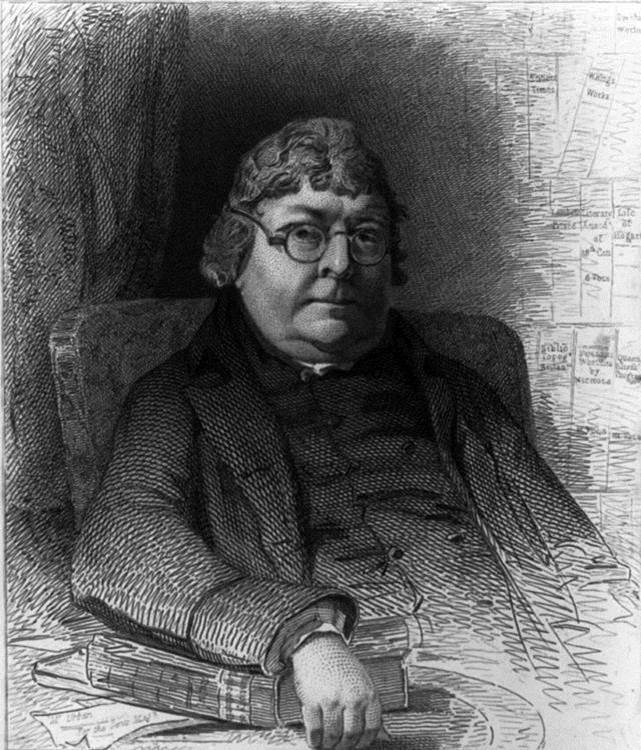 We should start with John Nichols (1745-1826), a baker’s son from London who became a printer and publisher in the latter part of the 18th Century. He married a woman from Hinckley and became well known among the Leicestershire County set. He was also an enthusiastic Fellow of the Society of Antiquaries, and he set about compiling and publishing The History and Antiquities of the County of Leicester, his best known work. His company also produced The Gentleman’s Magazine, for a large part of its continuous run from 1731 to 1922. The History and Antiquities eventually took some 20 years to complete, by which time it had grown into a monumental work of eight bulky volumes. The final part was published in 1815, hence 2015 is its bicentenary, and a programme of celebratory events is currently being led by the Leicestershire Archaeology and Historical Society. There are two sections in Nichols History and Antiquities that deal with the Belvoir area. The year 1795 saw the publication of Volume II Part I, which contains a long section on the history of Belvoir Castle (including the barons, earls, dukes and priory), together with sections dealing with each of the villages in Framland including Bottesford and Muston. Later, in Volume VI, Nichols presented The Natural History of the Vale of Belvoir, largely written by George Crabbe, poet and chaplain to the Duke of Belvoir. Nichols prepared his county history by getting friends and contacts to research and write individual passages, which he then assembled into the published work. His collaborators worked from manuscripts and other documents to extract important passages or even copying out whole sections to be included in the final work. There were also numerous illustrations including engravings of buildings and monuments by artists such as Jacob Schnebbelie (1760-1792), whose work included monuments in the Framland area. However, what is often lacking is much attempt to explain the background and significance of many of the documents quoted, or to show how they relate to each other. As the Nichols scholar Julian Pooley has said, Nichols was very much an “antiquarian” who recorded what he found, rather than a “historian” in the modern sense of someone who seeks to develop a narrative interpretation of past events. We are left having to read between the lines. In the case of the Edmund Roos’s petition and what I shall call Lovell’s Act, there is little direct information about the background. Belvoir Castle was in ruins, and there were few if any documents coming from that source. We need to look at the wider issues to try to infer what might have been going on. At the centre is the question of what Edmund Roos had done to deserve the very personal treatment he got at the hands of Parliament by means of Lovell’s Act. Parliament was a servant of the king, and it would only have been on his instructions that it might issue an Act whose object was the control of one specific individual, something which would seem bizarre and extraordinary if it happened today. But in the late 15th Century, politics were personal, as the king had to exercise control of a small group of peers and courtiers, men who he did not trust, whose individual power and resources he had to rein in. Nichols gave us almost our only account of the history of Belvoir from the Conquest to the 18th Century. There had been a castle throughout that time, from which the noble lords gazing over the lands of the Vale could say “all this is mine”. Changes of family name occurred only when the succession passed via the female line; Todeni into d’Albini, then de Roos, then Manners; an unbroken sequence to the present day, with only one gap. This was the period of over 60 years between 1461 and 1524, including most of the Wars of the Roses and the early Tudor period. Buried in Nichols’ account of Belvoir are the two passages discussed in this talk. Both date from the years after 1485 and the Battle of Bosworth, when Henry Tudor had gained the throne. On page 39 of Volume II Part I, Nichols presents us with the Petition sent from Edmund Roos to the new King for the return of his father’s titles and estates. Sir William Hastings and his heirs had held Belvoir since it was granted them by Edward IV in 1461, following the attainder of the 9th Baron Roos. The Hastings had been absentee landlords who had allowed the castle to fall into ruin. After Bosworth, Henry VII had recovered the castle from the Hastings, and so at the time of the petition it was the king that was owner. The effect of this was, as I see it, to grant to Edmund ownership of the estates and castles etc. in Yorkshire, Belvoir, Norfolk and elsewhere, and to the title Baron Roos and bear the family arms, but crucially he had to surrender the ‘issues and profits’ from his estates to the king year by year until the king should decide to cancel the obligation. This placed Edmund in an unenviable position. He could hardly say no, yet he was obliged to spend his time running the vast estates for the king’s benefit. This was probably not what he had intended, but it seems to fit with Henry’s way of extracting a price for his generosity. Henry was insecure. He had many enemies, but he was very determined and astute, with a robust way of dealing with those he didn’t trust, which seems to have been most people. His strategy, as it developed, was to use money as a weapon to enforce obedience and intimidate opposition. In 1485 he was only just beginning his reign, and his ability to manage its finances were not as yet very good. He badly needed funds to overcome the Lambert Simnel and Perkin Warbeck rebellions and other Yorkist threats. Edmund also lacked experience in estate management, having spent his adult life in exile. He probably had problems in gaining control of them in the first place. Presumably it was easy for Henry to grant him possession of Belvoir, but the other estates might have been problematic, including the Roos ancestral home of Helmsley where his sister Eleanor and her family had been settled for many years. Would they meekly stand aside and let Edmund take over and try to manage ‘their’ property for the benefit of a king they almost certainly did not want to support? Nevertheless, E.H. Moreton tells us that Edmund did indeed regain Helmsley in 1485, but the Roos-Manners remained in residence and may have been a thorn in Edmund’s side for the years to come. With this in mind, we should move on to the second of Nichols’ passages, again on page 39, in which he gives us word by word the text of an Act of Parliament of 1492. These words have been much quoted, for instance by Irwin Eller in his 19th Century account of the history of Belvoir Castle, and in the biography published by Steven Gunn in the Oxford Dictionary of National Biography. Yet it is unclear what Edmund Roos had done to deserve such a public and regal judgement? Was he insane? Had he defrauded or misled the king? It is not explained. My view is that it may have been a form of words to engineer a way to push Edmund Roos aside and systematically use his inheritance to boost the royal coffers. The terms of his dismissal may have been concocted or exaggerated on the basis of some real misbehaviour. There may well have been genuine disputes or legal infringements. One could suspect that Lovell and others had looked at the books and concluded that Edmund was not trying hard enough, and so they decided to send in Lovell, one of Henry’s enforcers, to take matter in hand. Edmund was not being accused of specific offenses. He was not being tried as a criminal. Perhaps he had been unable to come to an arrangement with the Roos-Manners of Helmsley. Perhaps his estate stewards had been syphoning off the profits behind his back, or he had simply spent too much time enjoying his new freedom in hunting and other pursuits. Perhaps he had secretly married or had an illegitimate family that he was supporting. Whatever the reasons, we are not told. The Act continues: willeth by th’auctorite of this present parlement … that Thomas Lovell, knyght, have the guydyng and governaunce of the said Edmond, from the fest of Seynt John Baptist in the second yere of the reigne of our sovereign lord, of all the castelles [etc.] to the said Edmond restored, and descended to the said Edmond. The law is being manipulated to give Lovell and the King control of the Roos estates. Control, and in due course outright ownership, of the Roos estates are vested in Thomas Lovell, Henry’s “square-jayed” Chancellor. In other words, when Edmund dies Lovell will become in effect the owner of the Roos estates. Lovell will pay the king 700 marks on June 24th each year out of the Roos estates. This repeats the clause originally added to the petition of 1485/6, such that the king continues also to receive the profits, if there are any once the annual fixed sum has been paid. … after the decesse of the said Thomas Lovell our said sovereign lord shall have, perceive and enjoye to his own use all the issues and profits of all the said castelles … during his pleasure, in the like manner and fourme as it was ordeyned upon the acte of restitucion aforesaid. The king will continue to enjoy the ‘issues and profits’ should Lovell die until he annuls the act. Richard Roos is awarded £40 annually from Roos estates in East Anglia. This appears to refer to Richard Roos (1429-c.1493), a Norfolk gentleman with connections to the Pastons and the Mowbray Dukes of Norfolk. He was a nephew of Richard Roos, fifth son of William, 7th Baron Roos. The Duchess of Norfolk takes receives £40 annually up to a total of 600 marks for the benefit of Richard Roos’s daughters. The duchess in question would have been Elizabeth Beauchamp, widow of John de Mowbray, 4th Duke of Norfolk, who had died in 1476. She was a niece of Eleanor Beauchamp, mother of the attainted Thomas, 9th Baron Roos. It is worth adding that in 1492 there was no duke of Norfolk. The most recent duke, John Howard, had died with Richard at Bosworth, after which the title was confiscated and his son Thomas, The Earl of Surrey, imprisoned. He would not recover the title until he had emerged victorious from the Battle of Flodden in 1514. Under this Act, Lovell agreed to pay the King a fixed annuity. The mark was worth 2/3 of a pound (13s.4d), so 700 marks was the same as £466 13s 4d. In addition there were £40 to Richard Roos and £40 to the Duchess of Norfolk, making total annual payments of £547. What would this amount be today? The website www.measuringworth.com , created by a panel of economists, yields a range of values, depending on different criteria. The best may their ‘Purchasing Power Calculator’ or ‘Historic Standard of Living’, similar to our RPI. This yields a value of £309,100 at 2014 rates for the £467 annuity paid to the King. If we add the payments to Richard Roos and the Duchess of Norfolk, the £547 paid in 1492 would be £362,000 in 2014. Moreover, because the royal annuity was in effect back-dated to 1486, there would also have been seven years of arrears due in 1492, which amount to over £2 million at current rates. Going forward, there would have been 16 more annual payments before Edmund died in 1508, amounting almost to a further £6 million. Adding all this up, we get a total payment from the Roos estates to the crown, the poet and the duchess, over the period 1492-1508, of about £8 million at 2014 rates. This is what the estates were to hand over during the lifetime of Edmund Roos, regardless of whether there were any actual profits to meet them: if any surplus remained then the King would be entitled to it as well. This sounds like a lot of money, but it was probably affordable. For instance, Steven Gunn’s refers to it as: “the generous arrangement …. £466 13s 4d a year to Henry out of a total income valued in 1524 at £1,310 16s 3/4d”. Turn back the clock to 1460. Imagine tearful farewells on the steps of Belvoir Castle (when it really was a castle). Thomas 9th Baron Roos (or ‘Ros’, as it is often spelt) is leaving with his armed retinue to join Henry VI’s army fighting the Yorkist insurgency, leaving his wife Lady Philippa and their daughters behind. Sir Thomas was the latest of a proud, long-established, noble line that had become close supporters of the Lancastrian camp as the dispute with the Duke of York deepened into civil war. At the Battle of Towton (14th March 1461) accounts vary but it seems he was either one of those who escaped the rout or was away from the battlefield guarding his King. Either way, he accompanied the fugitive monarch north to the safety of Northumberland, and lived on until following the defeat at Hexham in May, 1464, he was captured and beheaded at Newcastle. Edward IV claimed the throne on 4th March, 1461, and later that year he attainted Sir Thomas Roos, among other Lancastrians. ‘Attainder’ was a legal process whereby the accused was stripped of his titles and property, and cast outside the protection of the law. His family’s traditional strongholds of Helmsley and Belvoir, with all their other estates, would have been confiscated by the crown. After Roos’s execution, Edward granted Belvoir to his right-hand man in the Midlands, Sir William Hastings, along with the Leicestershire castles at Ashby-de-la-Zouch and Bagworth. Eller (1841), following Leland, tells the story of Hastings’ arrival at Belvoir (p.30/31). “The possession of the castle was not however rendered without a struggle on the part of an attached friend of the Lord Ros”. When Lord Hastings came for the purpose of surveying his new possession, and contemplated residence, at Belvoir, Mr Harrington (described by Leland, “as a man of power thereabouts, and a friend of the Lord Ros”) suddenly attacked and drove away the intruder. Exasperated at this unexpected opposition, Lord Hastings afterwards came with a strong force, and “with a bitterness of rage scarcely intelligible, so injured the noble mansion, which had now become his own, that the castle fell to ruin. The timber of the roof being despoiled of the lead, with which it was covered, rotted away; and the soil between the walls, at the last, grew full of elders: in which state the castle remained, till it was partially rebuilt by the first Earl of Rutland, and completed by the second”. Hastings carried the lead he had thus obtained to Ashby-de-la-Zouch where, in the words of Leland, “he much builded.” Hastings’ arrival was the start of the period in which Belvoir stood empty, governed by absentee landlords, until the reign of Henry VIII. Ironically, Hastings was beheaded by Richard of Gloucester in 1483, and did not live to see his rebuilding of Ashby Castle completed. Baroness Phillipa was born Phillipa Tiptoft in 1423, daughter of John Lord Tiptoft and Joyce de Cherleton. She died in 1485 or in 1487, at Great Eversden, Cambridgeshire. Her first husband was Thomas, 9th Baron Roos. According to Eller (1841), their first child Edmund Roos was born in 1446 (though an alternative date of 1455 has been given). In 1461 when his father was attainted Edmund would have been 15 years old, his sisters Eleanor and Isabel 12 and 10 respectively, Margaret and Joan younger still. Nichols does not tell us where they lived from 1461. My guess is that Edmund was with his father. Lady Phillipa and her daughters may have stayed at Belvoir Castle or more probably at Helmsley Castle. E.H. Moreton (1963) wrote: “Thomas Lord Roos … was attainted in 1461 and his estates, including Helmsley, confiscated. His mother Eleanor appears to have resided at Helmsley from 1461 until her death on March 6th 1467 for she held the castle and manor in dower. She was succeeded at Helmsley by Margery widow of John the 8th lord, although in 1465 Edward IV had granted the reversion of the estates to his brother George, Duke of Clarence. In 1478 Richard of Gloucester … purchased the castle from the de Ros family, but it is uncertain whether he ever took up residence there. … The final triumph of the Lancastrian party in 1485 restored Helmsley to the de Ros family. Edmund, 11th lord, obtained the reversal of his father’s attainder, but since he was “not of sufficient discretion to guyde himself and his lyvlehode” custody was given to his brother-in-law, Sir Thomas Lovel, who held the castle and manor. Edmund died unmarried, and the barony of Ros fell into abeyance. But the property came into the Manners family by marriage to Eleanor, Edmund’s sister”. Thus the dowager duchesses, Eleanor Beauchamp, widow of Thomas, 8th Baron, and Margery le Despenser, widow of John, 7th Baron, Philippa’s mother and aunt, continued to hold Helmsley up to and after 1467, even though it been granted by Edward to the Duke of Clarence. Perhaps Clarence allowed it to remain with the Roos in exchange for a sum of money. It is clear that daughter Eleanor and her family remained there for many years afterwards. Philippa married twice more. Her second husband was Thomas Wingfield (1438-1475), of Letheringham, Suffolk, who was related to the Dukes of Norfolk. Wingfield was a soldier in the service of Edward IV, who knighted him after the Battle of Tewkesbury. His brother Richard married Catherine, sister-in-law of the queen, Elizabeth Woodville. Thus by this marriage she emphatically distanced herself from Sir Thomas’ Lancastrian affinity, and attached herself to the new king’s circle of supporters. Her third husband was Edward Grimston, probably the diplomat of this name who died in 1478, whose portrait by the Flemish artist Petrus Christus hangs in the National Gallery. We may ask how the marriages of Phillipa and her daughters to up and coming Yorkist soldiers came about. Could it be that her brother John Tiptoft, Earl of Worcester played the role of marriage broker? John Tiptoft was a soldier, politician and also a scholar who while studying at Padua is said to have moved the Pope to tears by his eloquence. In 1462 Edward IV appointed him Lord High Constable in which position he presided over trials and execution of Lancastrians, which he carried out with exceptional cruelty, earning him the epithet “The Butcher of England”. He was executed in October 1470 during the brief “Readeption” of Henry VI. His only son Edward died without an heir in 1485, leaving Elsing to Phillipa, who in turn left Elsing to her son Edmund Roos. Eleanor (1449 – 1487), eldest daughter of Thomas and Phillipa de Roos, married Sir Robert Manners in 1465 or thereabouts. Sir Robert was an MP and retainer of Richard of Gloucester, who knighted him and appointed him Sheriff of Northumberland in 1463, Undersheriff in 1485, and Admiral of England. He fought with Richard at Bosworth. The Manners were Northumberland gentry whose ancestral home, Etal Castle, guarded an important ford across the River Till close to the Scottish border, never an easy place in which to live, contested by the Percies and Nevilles but governed by Richard during his brother’s reign. There was the danger of Scottish invasion, as did indeed happen in 1497 and again in 1513 when the castle was taken by James IV before the Battle of Flodden. The Manners had also been involved in a feud with their neighbours, the Herons of Ford Castle. On 20th January, 1428, they came to blows outside Etal, and William Heron, head of the family, lost his life. Willliam’s widow accused John Manners of murder, but after arbitration by the Church, John agreed to pay for 500 masses for William’s soul and to give 250 marks to his widow. Was this an attractive place for Sir Robert to bring his new bride? They may have opted instead to spend time at the Roos stronghold at Helmsley. As we have seen, the castle was the home of two dowager baronesses, Eleanor Beauchamp, d.1467, widow of Thomas, 8th Baron, and Margery le Despenser, widow of John, 7th Baron. This may well have been a far safer and more comfortable place to start a family. Edward IV awarded Helmsley to his brother George of Clarence in 1465, but it is clear that the Roos-Manners remained there throughout these years. Authorities such Collins & Bridger confidently state that Sir Robert ‘inherited’ the castle. Under Thomas Roos’ attainder, Edmund would have been disinherited, but ownership probably stayed in the family through the dowager Baronesses, who may have elected with Clarence’s assent to leave it to Phillipa’s daughter and son-in-law. Then we are told that in 1478, the Manners sold Helmsley to Richard of Gloucester, confirming that they were certainly recognised as owners following Clarence’s execution, but it is unlikely that Richard took up residence (Moreton, 1963). After Richard’s death, it would have gone to the crown, that is to Henry VII, and then been released to Edmund Roos even though, as already said, the Roos-Manners continued to be in residence. Their son George, later Sir George Manners, born c.1470, became 10th Baron Roos on the death of Edmund Roos in 1508. Despite his father’s association with Richard III, he was a loyal supporter of Henry VII, knighted in 1497 after fighting in Scotland during Perkin Warbeck’s insurgency, and died in 1513 at the siege of Tournai. In 1490 he married Anne St Leger (1476-1526), the only child of Sir Thomas St Leger and Anne of York, elder sister of Edward IV. Anne of York had been married to Henry Holland, 3rd Duke of Exeter, a notable Lancastrian Commander, but the Duke and Duchess separated in 1464 and divorced in 1472. Anne of York remarried in c.1474 to Sir Thomas St Leger, who was executed in 1483 after taking a prominent part in Buckingham’s Rebellion. Anne of York had died in 1476, giving birth to their only child, Anne St Leger, who inherited her mother’s considerable fortune. Sir George Manners and Anne St Leger had a large family, and their oldest son Thomas Manners was next in line to inherit the Roos estates as and when Lovell released them. Isabel Roos, Eleanor’s younger sister, seems to have died in 1508, the same year as her brother Edmund. She had three husbands. The first was Sir Thomas Everingham of Stainborough, Yorkshire (now Wentworth Hall, near Barnsley). Described as the “Knight of the North” (Meek, 2001), and “one of Richard’s Sea Captains”, he fought for Maximilian, The Holy Roman Emperor, in the Low Countries, and in 1484 was granted the lordship of Guisnes (one of the fortresses that guarded Calais). Later that year he was captured by the King of Scotland off Scarborough, but then quickly ransomed by Richard III. He probably died soon after. Her second husband was Thomas Grey. There were many families of Greys, but this was probably Thomas de Grey, born 1456 at Chillingham, Northumberland, as confirmed by genealogists contributing to GENI (www.geni.com) who also record that Isabel Roos was his second wife, that they had no children though he had had four by his first wife, and that he died at Chillingham in 1498. It is unclear whether Thomas Grey was a Lancastrian or not. Isabel’s third husband was Sir Thomas Lovell. I have found no clear indication of the date of this wedding. Historian Steven Gunn believes it came about by “the King’s influence”, but is unclear what he means by this. The date we have for Grey’s death indicates that her marriage to Lovell could not have been before 1498, and was therefore some years later than when her brother Edmund had been deprived of his affairs and placed under restraint. It may be that she came south to be with Edmund after Grey had died, and that she then married Lovell for family reasons. 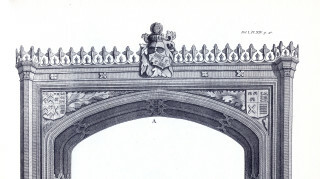 Lovell came of Norfolk gentry and had been a lawyer at Lincoln’s Inn, where he was Treasurer from 1472-1475. He was one of the stars of Henry VII’s government. In 1483, he joined Buckingham’s Rebellion. Richard III defeated the rebels, but several of them fled to Brittany and joined the exiles gathered around Henry Tudor, Thomas Lovell and his brothers among them. They fought with Henry at Bosworth and remained close supporters of Henry VII. Thomas Lovell was knighted in 1487 after the Battle of Stoke. He was Chancellor of the Exchequer and also Treasurer of the Chamber and Household throughout Henry’s reign, and continued to serve loyally well into Henry VIII’s reign. He was Speaker of Parliament in Henry’s first parliament of 1485/6, when Edmund Roos submitted his petition. Steven Gunn’s account of Lovell’s career presents a portrait of an extremely hard working and ambitious lawyer, soldier, diplomat, judge and financial wizard, a key member of Henry’s great council, in some ways a forerunner of figures such as Wolsey and Cromwell. He was also expert at what we would call man-management, and accumulated a great number of retainers through whom he maintained his array of offices and activities. Lovell married twice. However, there were no surviving children from his first marriage, and there would be none from his marriage with Isabel. When she died in 1508 her inheritance went to her nephew George Manners, though is unclear what this amounted to. After losing Isabel, Lovell lived on until 1524, becoming very rich and replacing medieval Elsing Manor with a Tudor show-house, Elsing Palace, which eventually passed to Henry VIII. Edmund had been sent into exile “across the seas”, but Nichols does not tell us where or when. He may have fled to Northumberland with his father in 1460, and left when Sir Thomas was attainted in 1461 or later during the period to 1464 when his father was still alive. Edward the Prince of Wales fled from Scotland to the Duke of Burgundy in 1464, and it seems possible that Edmund might also have sailed to the Low Countries at about this time. Henry Tudor fled from Pembroke to Brittany in 1470, and is unlikely that Edmund Roos could have joined his retinue of exiles or the army that landed at Milford Haven in 1485. Nevertheless, Richard’s death in 1485 gave him the chance to return and attempt to recover his inheritance. Once installed in his mother’s house at Elsing he petitioned the new King for the return of his father’s title (Baron Ros) and estates. This is the petition reproduced by Nichols. If only he had been content to live quietly at Elsing, but he was “a man on a mission”, not least because he probably had little personal wealth or income to maintain himself. Nichols tells us that Henry assented to the petition, making Edmund the 10th Baron Ros, and giving him ownership of Belvoir, Helmsley and other former Roos estates and properties. As we have seen, Edmund’s position was complicated by the conditions imposed by the King in giving his assent. One, by which Phillipa should retain her own property, was to his to his advantage in that Edmund inherited Elsing on her death. The second condition was definitely not innocuous. The king’s generosity was tinged with a view to gaining something to his advantage. Henry reserved to himself the ‘profits’ of the Roos estates, which would thus be used to generate funds for the king, with Edmund responsible for undertaking the operation. He would be deprived of the income generated by his estates. Moreover, the King’s councillors, would have a good idea of their value and therefore what ‘profits’ to expect. If Edmund fell short then he might be in for trouble. The position would have been made doubly difficult if there was a prolonged dispute regarding the ownership of Helmsley in which Sir Robert asserted that he was owner and had been in possession for several years. He was perhaps lucky. With time, the insecure, mistrustful King adopted ever more ruthless means of using money as an instrument of power, including use of ‘recognizances’. These were bonds entered into by the accused party, which could be designed to be so enormous that their estates would be largely or entirely in the King’s power. The ‘victim’ would be permitted to settle for a more affordable annual payment on condition that he did not overstep specific limits of conduct. The aim was, as Edmund Dudley put it, “to have many persons in danger at his pleasure”. The richer the accused was, the more he could pay. It has been estimated that about three-quarters of the noble families in England were at some time either under attainder or bound to the king by recognizances. The effects of Lovell’s Act of 1492 seem similar to a recognizance, and it may have been a forerunner of what later became familiar. In Edmund’s case, instead of an un-payable debt, the response to his 1486 petition had placed him at risk of being deprived of his estates by being placed under supervision and “under some form of restraint” (we are not told what this meant), as indeed he was. The 1492 Act now seems to make sense. Arrangements with the Manners may not have been resolved, the crown receiving less funds than it expected. Edmund was probably being pursued and spied on by Lovell on one side and defied by the Manners on the other. I suspect he felt he was trapped, unable to escape. Well might he have become deranged. Perhaps he tried literally to flee, or to squirrel away more of ‘his’ money than the Chancellor would allow him. We will probably never know exactly. Whatever was the case, Henry and his councilors decided to move to the alternative plan. Edmund was placed under supervision, and Lovell assumed direction of the estates. At Bottesford, we catch a hint of these events in the records of Rectors and their Patrons at St. Marys. The new Rector in 1470 was patronised by King Edward IV, and there were three in the 1470s for whom Sir William Hastings was patron. Then in 1492 Rector Simon Stalworth had Edmund Lord Roos as patron, but in 1511 we see that the Patron of the next rector, Thomas Pert, was Sir Thomas Lovell. This seems to confirm the reality that Edmund Roos did indeed recover the Belvoir estate and that ownership had passed to Sir Thomas Lovell by 1511. Edmund became Baron Roos and owner of the Roos estates in 1485, then his mother Phillipa died in 1487 or thereabouts, leaving Elsing Manor to Edmund. In 1492, Thomas Lovell assumed control of the affairs of the scattered Roos properties in order to ensure that the king received the income he expected from them, while Edmund was obliged to remain out of harm’s way at Elsing. Lovell married Edmund’s newly widowed sister Isabel about 1500. Edmund Roos lived on for another sixteen years, dying in 1508, a year before the death of Henry VII. Sir Robert Manners had already died, leaving his very capable son in charge at Helmsley. Sir George Manners was loyal to the Tudor monarchy and had served Henry VII as a military commander. He went on to serve Henry VIII, as a captain in the king’s army in Flanders, but died during the siege of Tournai in 1513. Throughout, it appears that Lovell remained in charge such that the annuity agreed in 1492 continued to be paid at least until his death. However, renewed uncertainty creeps in here. The English Heritage booklet for Helmsley states that soon after ascending the throne, Henry VIII rewarded Sir George by cancelling ‘his’ annuity. Lovell was very much alive at this time, and we may ask what the annuity was that George Manners had been paying. Had Lovell made an agreement whereby George Manners would take on some if not all of the 1492 annuity in return for being recognised as owner of Helmsley? This would legitimise the de facto arrangement while relieving Lovell of the chore of managing the estate finances (he had much other business to attend to). Indeed, had there been such an agreement, it is tempting to imagine that it also included the Belvoir estates, so that Sir George Manners had come into possession of both Helmsley and Belvoir by the time Henry VII died. Visitors to Etal may spot the information board which, in describing its capture by James IV before Flodden, states that the owner George, 11th Baron Roos was not affected by these events because he was living at Belvoir. Sir George was succeeded by his son Thomas, who became Sir Thomas Manners, 1st Earl of Rutland and Knight of the Garter. Interestingly, his first wife Elizabeth Lovell was a niece of Sir Thomas Lovell. Sir Thomas’s second wife Eleanor Paston is the lady seen on the tomb in Bottesford church. Lovell remained in possession of Elsing until his death in 1524. He had become a very rich man, and decided to rebuild Elsing as a sumptuous Tudor palace fit to receive the king. The result was Elsing Palace. Nothing remains of this building, though its foundations were uncovered by archaeologists in the 1960s. In his will, Lovell left most of his wealth to his nephew Francis Lovell, but the old Roos property went to his great-nephew Sir Thomas Manners, who became owner of Elsing Palace. Then Henry VIII purchased the palace from him, and it became a preferred home of the royal children, close to the forest of Epping. Later, King James I sold it to a London banker who had it demolished and replaced with the Jacobean mansion which stands in the grounds today. The sale of Elsing made Sir Thomas Manners rich, with the wealth to start the rebuilding of Belvoir. The rebuilding proceeded slowly and was only completed by his son, the 2nd Earl of Rutland. Regrettably, we do not appear to have a picture of this building, which was pulled down after the Civil War. Presumably it was a Tudor palace, in contrast to the medieval fortress that had preceded it. Helmsley remained a home of the Manners family. Edward, the 3rd Earl certainly lived there. Visitors will see the Manners heraldry in the living quarters built in the old castle, and in the artist’s impression the Earl, his wife Isabel Holcroft and their daughter Elizabeth, relax in domestic comfort by a roaring fire. No mention of Belvoir here. The castle finally passed out of the Manners in 1632 when it passed to the Duke of Buckingham, whose wife Katherine was heiress of the 6th Earl. We see the passage of the old estates of Belvoir and Helmsley from the Plantagenet world of the Barons Roos to the post-Reformation world of the Tudors and the Earls of Rutland. The story has taken us through the traumatic transformation from catholic England to the creation of a protestant, Anglican country. Belvoir Castle was ruined, Belvoir Priory and Croxton Abbey pulled down. A Tudor house rose to replace the castle and Bottesford church altered to accommodate the mausoleum of the Earls of Rutland. This has not been straightforward, nor is the sequence of twists and turns entirely clear. There are many gaps in our knowledge, so that we are forced to speculate about many of the details. The key event was the marriage of Eleanor Roos to Sir Robert Manners, but there was no guarantee that this would have led to the establishment of a new aristocratic line that would remain at Belvoir to the present day. Edmund Roos’s dramatic intervention stands out. Had he had a son and heir the outcome might have been very different, as indeed it might had Sir Thomas Lovell not died childless. This is a tale of events within a stratum of aristocratic society beneath the level of the kings and dukes who fought each other to the death in the Wars of the Roses. In its way it is perhaps an example of the fall of the old feudal aristocracy, with a new aristocracy rising from the gentry to fill the space created. Meek, E.L., The career of Sir Thomas Everingham, ‘Knight of the North’, in the service of Maximilian, Duke of Austria, 1477-81. Historical Research, vol.74, 238-141, 2001. Moreton, E.H., Mediaeval Helmsley. Pp. 81-101 in McDonnell, J. (ed. ), A History of Helmsley, Rievaulx and District, Stonegate Press, York, 1963. Nicols, John, History and Antiquities of the County of Leicester. Volume II Part I Containing Framland Hundred. 1795, Republished 1971 by S.R. Publishers Ltd in association with Leicestershire County Council. Storey, R.L., The Reign of Henry VII. Blandford Press, London, 1968. Thomson, John A.F., The Transformation of Mediaeval England 1370 – 1529. Longman, London and New York, 1983. This page was added on 12/01/2015.